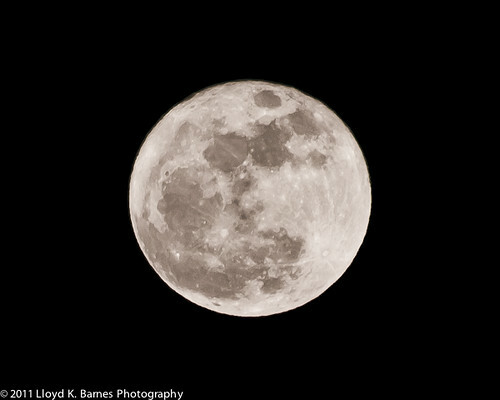 The full moon last night was a supermoon, and was the closest to the earth that it's been since 1993. Because the orbit of the moon is an ellipse instead of a perfect circle, its distance to the earth varies from about 357,000 km (perigee) and 406,000 km (apogee) each month. When the full moon occurs at the perigee, it's a supermoon or super perigee moon. The supermoon is about 12% larger than the average full moon because it's closer to the earth. Then next time the full moon will be this close will be November 14, 2016. I took the opportunity to photograph the supermoon because it was a clear night (rare for Vancouver in March!) and an excellent opportunity to get as detailed an image of the moon as possible with my camera. I used a 50-200 mm zoom lens at 200mm with a 1.4x teleconverter (to give an effective 283 mm) at f/5.6 and 1/100s s and ISO 100. I used a tripod with a remote and a 2 second timer to prevent camera shake. The image was cropped and sharpened using Adobe Lightroom 3.3. Did you take photos of the supermoon? Share your links in the comment section below!